Running is one of those passions that had been part of my life for a long time and so like many I wondered if there was life beyond the marathon distance. Naturally I soon found ultra running and the unique group of individuals that comprised the sport. 2002 was the year I ran and completed the 100 and I was amazed by the experience of running with the horses. Now horses were not unknown to me as my wife has owned them forever but I had never really paid much attention to them as riding in circles or hanging out at a barn was not my idea of fun. At any rate there I was camping at Smoke Rise Farm and I saw all the horses and their riders also preparing for the 100. Early the next morning to the sounds and lights of fireworks and the pianist playing we were off. It wasn’t long before we heard the call “horses coming” and all parted to the side of the road so the horses could pass. It just seemed natural to us runners to get out of the way as no runner wanted their feet stepped on, I was surprised to learn from the riders how they thought it was wonderful we runners moved over for them. They had no idea we were worried about being trampled. The run was long and wonderful as 100 mile events tend to be and while not the fastest person out there by a long shot I along with three of my friends finally crossed the finish line. Anyone who has done that can tell you it is about as close to total fulfillment as one can achieve or so I thought. Throughout the run I kept being overtaken by the horses and wondered why they were behind me (turns out they have mandatory veterinarian checks and rest breaks) and was amazed at how easily the horses and riders seemed to have it. Let me assure you they do not have it easy quite the opposite in fact. 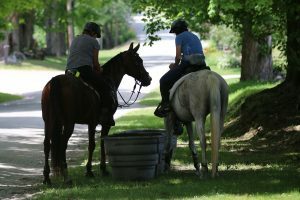 Granted the physical toll on the riders is less than that of runners but the work required to get a horse ready and able to go 100 miles is difficult. At any rate at the end of the run I told my lovely wife I wanted to learn to ride, buy a horse and do the 100 on horseback. I suspect she and many others knew at that point I really was insane as if the ultra running wasn’t crazy enough. The old saying “any idiot can run a marathon but it takes a special kind of idiot to run ultras” was playing in my mind and once I discovered how much work a horse was I wondered what I had gotten myself into. I had heard that a couple of ladies had run and ridden the Vermont 100 and knew the people that had done Tevis and Western States at that time, but there didn’t appear to be any other guys who had done both at Vermont. So I learned to ride, bought a horse then another horse (they are like running shoes you need more than one pair) and began my journey. I had great mentors, Steve, Kathy and others who helped me learn the horse side of the equation. 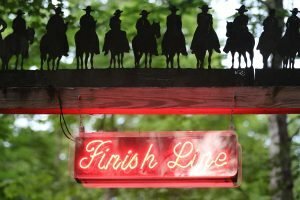 The knowledge of ultra running directly correlated to endurance riding so that made it easy, it was just doing the miles on horse that took time to learn. 2004 saw us at Silver Hill the first year it was held there I think. 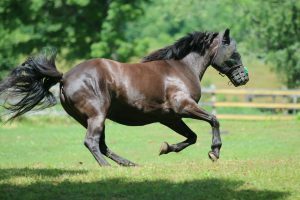 My horse Tashi Smar aka Summer was an experienced 100 mile equine and since I knew the course I was ready. It was wonderful to thunder off with the other horses and to begin the chase after the runners. I too got to watch the runners part as we rode by and since many were my friends met during previous runs the goodnatured bantering was fun. “Get off that horse they would yell” and I would reply “no way”. It was amazing to ride up the back of Suicide Hill or the long climbs later in the course and while I worried a lot if Summer was happy (he was) it was fun to be able to actually watch the world go by. We cleared vet check after vet check thanks to my amazing crew and although we were in last place horse wise we were making good progress. At mile 72 however things took a turn and my riding partner Liz dropped out and the vets were having a discussion about whether or not a newbie like me should continue. Fortunately Art, a vet, I had come to know saw me lacing up my running gear and he told the rest of the vets the horse might not get there but I would. All was well in the world and off we went, Summer, me and all the runners. We finally hooked up with a 64 year old trying to break 24 hours and began our dash to the finish. That year we had to climb Blood Hill and then descend down a long shoot to the finish line in the meadow. Summer was lit up with glow sticks as the runner (damn I wish I could remember his name) and I ran (yes I was off the horse) across the finish line. Once again it was a feeling that one can only experience that enveloped us. Of course I had to vet the horse out one more time to get a completion but Summer being the pro he was took it all in stride. We were last place but our motto “to finish is to win” sang in my ears. There are some of you runners reading this and wondering if you can ride a 100 miles and some of you riders wondering if you can run 100 miles and I can only say is yes you can you just have to want to. 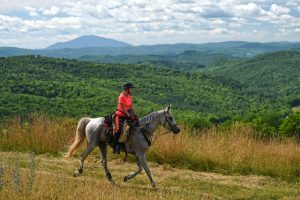 Please feel free to contact me if you have questions and join Krista, Kathy, and me (hope I didn’t forget anyone) as those who have ridden and run the magical Vermont 100.